Dell Inspiron Mini netbooks are designed to keep you connected on the go with access to email, shopping and much more. Are you experiencing sound problems after you have reinstalled Ubuntu on your Inspiron Mini netbook? Creative IT, based in Central London, with over 15 years experience in the computer, laptop and notebook repair business provides professional help for all your Dell Inspiron Mini netbook repair requirements in London and the UK. As part of our London Dell Inspiron Mini netbook repair services, we offer component level netbook computer repairs at the most competitive prices for Inspiron Mini 9, Inspiron Mini 10, Inspiron Mini 10v and Inspiron Mini 12 models. 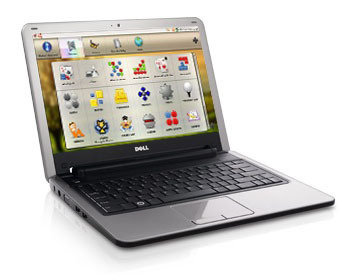 We also specialize in Dell Inspiron Mini netbook 12.1 inch and 10.1 inch screen repairs and replacements. We have a good stock of 12.1 inch and 10.1 inch netbook replacement screens. As part of our London Dell Inspiron Mini netbook repair services, once you bring your faulty netbook to our repair centre in Central London, we will be able to troubleshoot the problems you experience while you wait and give you a quote on the spot. If possible, we will also carry out the necessary repair and replacement services while you wait. Call one of our Dell Inspiron Mini netbook repair specialists today for a competitive quote. For more information about our London netbook repair services in UK, please contact us at 020 7237 6805 or send us an email at info@creativeit.tv.